This set was created especially for the sensitive energy field of children. They are gentle and effective. Children know instinctively which color they need so if possible, include their input when selecting sprays for them. Fuel the body and environment with the vibrational energy of color. Capture the essence of each color, making it easy for you and your child to add the color they need, no matter where they are. Combine the energy of a color with the healing influences of essential oils to gently and effectively shift energy. Foster a balanced and nurturing environment for children. Compliment the professional environment for teachers, therapists and childcare workers. Commit to conscious childrearing with natural, nontoxic products that can help to shift the energy in the home or any environment for the child. 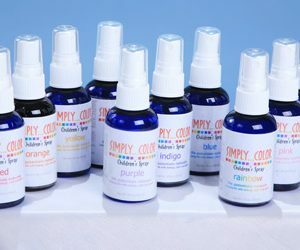 Empower children more directly, allowing their intuition to work by letting children choose the spray they are drawn to. Offers effective support for adults who want to nurture their inner child or who are doing work around childhood issues. The Children’s Simply Color Collection…Buy the set of 10, and only pay for 9. GET ONE FREE! Collection of all ten colors only $216!